And also, wheat germ is a super food. It’s an excellent source of nutrients including vitamin E, the B vitamins, and folic acid. Wheat germ can easily be a substitute for breadcrumbs for coatings and toppings and, like I’ve done in this recipe, it can be used to replace some of the flour in a recipe for an extra nutritional boost! And speaking of these biscuits, they turned out really well — flaky and herb-y, they’d be a great addition to a Thanksgiving meal. And if you need more inspiration, there’s a lot of recipe’s right here. All of this…can be yours (well, just the coupon). So, want to try some Kretschmer Wheat Germ for free? Well, just read through to the bottom of the post and leave a comment. Also, this is the first blog giveaway I’ve done and really, I’m a little nervous I won’t get any comments. Prove my anxiety wrong, okay? 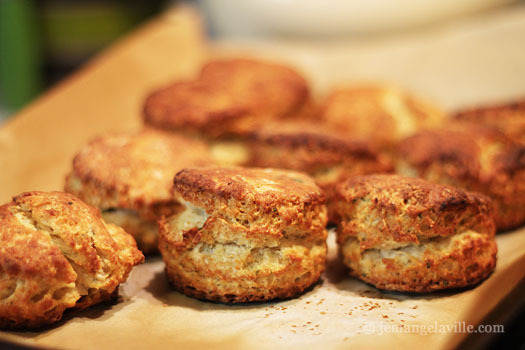 Adapted from a recipe by King Arthur Flour; makes 10 – 12 biscuits. 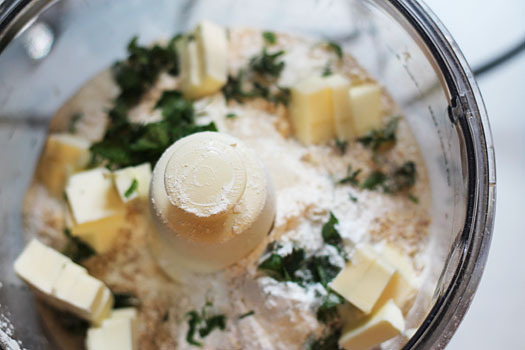 Preheat oven to 425 degrees F. In a food processor, mix together the dry ingredients. Add the butter and herbs and pulse until the butter is uniformly distributed into the flour, about the size of little peas. You can also do the butter-mixing-in by hand with a pastry cutter, if you prefer. Remove the flour & butter to a large bowl and a add the liquid all at once, mixing with a rubber spatula quickly until you the dough is soft. Roll the dough into a rectangle about 3/4-inch in thickness. Fold it in half and roll gently with a floured rolling pin until the dough is 3/4-inch in thickness again. Repeat another time or two. 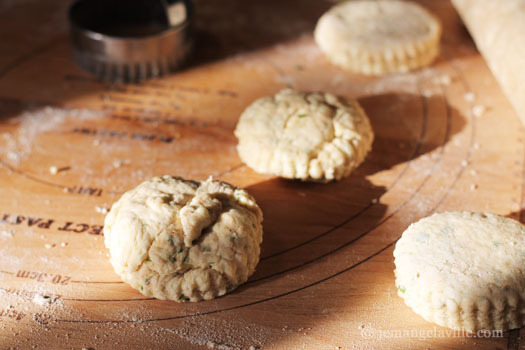 When the dough is rolled out to the 3/4-inch thickness for the final time, cut into circles with a biscuit cutter for traditional, round biscuits. 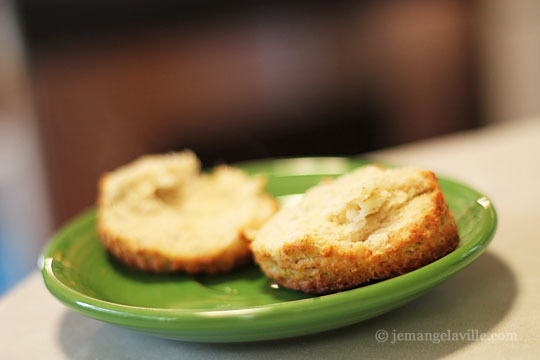 I patted my leftover scraps together to get two more biscuits — sort of like Franken-biscuits. Bake for 15 to 20 minutes, until they’re lightly browned. Now, for the giveaway: leave a comment below telling me what you’d try using wheat germ in — a chocolate cake, banana bread, added to the onion topping for green bean casserole — endless possibilities. On Friday, November 16, I’ll randomly pick one comment. If that’s you, I’ll get your address and send you out a coupon for a free jar of Kretschmer Wheat Germ! See, it’s all very exciting. 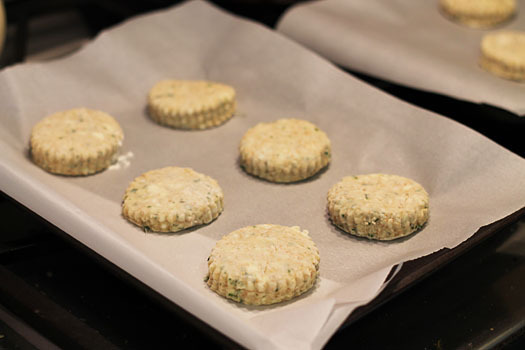 10 comments to Wheat Germ & Herb Biscuits and a Super Food Giveaway! I have, too, have added wheat germ to whatever I happened to be baking, but I haven’t done so in years! Thanks for the reminder; i’ll start doing it again. I’ve never had wheat germ before, but it sounds like it would go well in a banana nut breakfast muffin recipe. I usually replace part of the all-purpose flour with whole wheat flour to make them a little healthier, but I think they might be even better with the extra nuttiness that replacing some of the flour with wheat germ would bring! 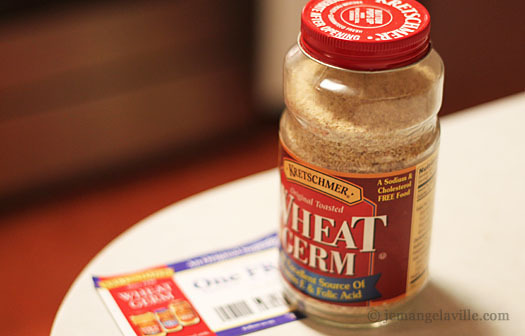 I make a lot of bread, but I’ve never really used wheat germ in it. I bet it would be really good in pizza dough! I like to make oatmeal cookies. I use some whole wheat flour to add a little nutrition. Sounds like wheat germ would be good there! I have a banana muffin recipe I have been dying to try, but on weekend mornings when I wake up early I remember I have no wheat germ and end up baking something else. Believe it or not, it’s very good in scrambled eggs. I’d add it to muffins. I would add it to a gratin with root vegetables to get the benefits of both the amazing fresh produce at the farmers market and further super food it! That will make up for the cheese right? I would add it to no knead bread. My go-to use for wheat germ has been to toast it quickly in the oven, then add it to pancake batter to add a little crispness to it. It’s not quite crunchy but it does cut through some of the overly cake-y texture, plus the nutty taste is perfect in any kind of pancake (chocolate bacon whole wheat flapjacks are my personal favorite! ).